In New Hampshire, Perry Says War Must Be "Last Resort"
Kicking off a two-day blitz in New Hampshire, former Gov. Rick Perry on Thursday morning offered a key caveat to his increasing outspokenness on foreign policy, cautioning that the United States' first response to global conflict should not be war. "As a former captain in the United States Air Force, as a captain who has flown into many of those regions in the Middle East, including Saudi Arabia, I'm not eager to pursue a military solution, a military action in that part of the world," Perry said during an appearance in Bedford, which was broadcast live on C-SPAN. "Wars must always be the last resort — after all other options are exhausted." Instead, Perry said economic growth at home is one way of projecting strength abroad and avoiding the kind of international dilemmas the United States has been sucked into under President Obama. The warning appeared to temper some of the perceived hawkishness of his recent remarks, all while blending in the biography that he has been increasingly emphasizing on the stump. During his stop at the Politics & Eggs lecture series, Perry also offered a fresh take on money in politics in response to a question about its corrupting influence after his prepared remarks. He said political donations in general should not be capped but should be disclosed "almost immediately." 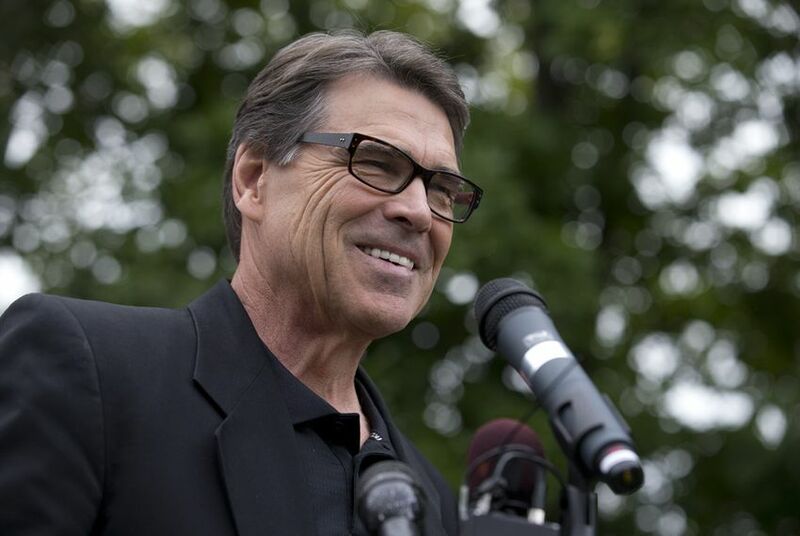 "I come from a state that has no limits on campaign contributions, and we are all about disclosure," Perry said, a line sure to cause eye rolls among some of his critics in Austin. "I'm a big fan of disclosure." In 2013, Perry vetoed a bill that would have required some politically active nonprofits to disclose who's giving them money, saying it would have a "chilling effect" on donors' First Amendment rights. Perry also was asked Thursday morning about a controversial letter from 47 Republican senators to the Iranian government, a move for which he tweeted his support Tuesday. The missive reminds Tehran that any nuclear deal it cuts with the Obama administration would not be constitutionally binding. Texas' U.S. senators, Republicans Ted Cruz and John Cornyn, signed the letter. "I am not a United States senator, but I signed that letter," Perry replied, shrugging off the idea the message undermined the president on the world stage. Sen. Tom Cotton, the Arkansas Republican who authored the letter, "could've just clipped out the Constitution and sent it to Iran," Perry added. Perry's remarks marked the start of a marathon trip to New Hampshire that features nine public events Thursday and Friday. It comes a day after RickPAC, the political action committee laying the groundwork for a 2016 run, announced it had hired three Republican operatives in the state, including veteran strategist Mike Dennehy, who helped John McCain win the New Hampshire primary in 2000 and 2008. On Thursday morning, Perry offered no new hints about when he plans to announce whether he is making a second bid for the White House, but he did repeat his long-held prescription for who is best positioned for the job. "Governors don't have the luxury of just having a conversation, giving a speech and walking away," the former chief executive of Texas said, continuing to put distance between himself and the senators contemplating a 2016 run, including Cruz. Perry ended his remarks by making clear his presidential ambitions are anything but fading. "I will be back," he said three times as he stepped away from the podium.